Ostmark (German pronunciation: [ˈʔɔstmaʁk] ( listen), "Eastern March") was the name used by Nazi propaganda from 1938 to 1942 to replace that of the formerly independent Federal State of Austria after the Anschluss with Nazi Germany. After Austrian-born Adolf Hitler had finally completed union between his birth country and Germany (Anschluss) the Nazi government had the incorporated territory renamed: the name Austria (Österreich in German, meaning "Eastern Realm") was at first replaced by "Ostmark", referring to the 10th century Marcha orientalis. The change of name was meant to refer to Austria as now being the "eastern march" of the Reich. In August 1938, the Donau-Zeitung proudly referred to Passau as "the cradle of the new Ostmark". "Lower Danube" (Niederdonau), name for Lower Austria, with its capital at Krems an der Donau, including the northern districts of Burgenland with Eisenstadt and the South Moravian territories around Znojmo (Deutsch-Südmähren) annexed with the "Sudetenland" according to the 1938 Munich Agreement. Vienna, i.e. "Greater Vienna", including several surrounding Lower Austrian municipalities incorporated in 1938. 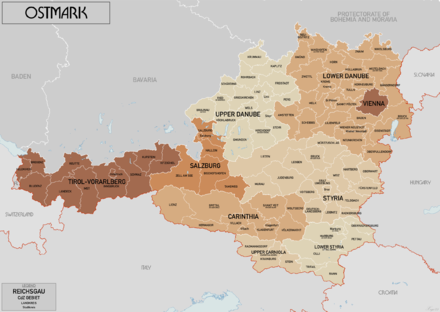 A Reichsgau was a new, simple administrative sub-division institution which replaced the federal states in the otherwise completely centralized Third Reich. From 1942, as the term "Ostmark" was still too reminiscent of the old, independent state of Austria, the chosen official name for the seven entities was Donau- und Alpenreichsgaue ("Danubian and Alpine Reichsgaue"). In the course of the Allied occupation after World War II, the Austrian state was restored in its pre-1938 borders according to the 1943 Moscow Declaration. This page was last edited on 28 December 2018, at 16:39 (UTC).